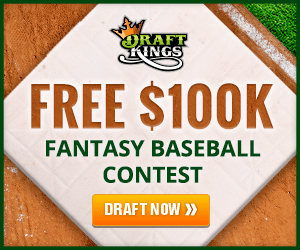 Stat nerd Steve shares his MLB Draft Kings’ Lineup for June 20th, 2015. After a slow start, Lester is pitching well of late. His ERA has dipped under 4 by a hair. His K/9 of 8.43 and BB/9 of 2.28 suggest that his ERA will continue to move toward the low 3’s. The 22 year-old rookie has put up impressive strikeout numbers and faces off against a mediocre Rangers lineup that has a tendency to strike out a lot. Martin comes in rested following a day off Friday night. With a .403 wOBA (weighted on-base average) at home, Martin should be valued as the top catcher on the board. Vogt gets a great matchup against righty Jered Weaver who has pitched poorly away from home, registering a 5.57 ERA. Coors Field remains the number-one ballpark for runs scored. LeMahieu is batting .352 at home and is facing off against a long past his prime Kyle Lohse and his 6.48 ERA. It’s a good day to stack lefties against the struggling right-hander. Part of the Rockies left-handed stack against Lohse. It’s been a brutal year for shortstops. J.J. Hardy has been swinging a hot stick lately, putting up an 11-game hitting streak that came to an end last night. It almost feels like a down year for Bautista with only 13 home runs. He still has his typical plate discipline (more walks than strikeouts) and an ISO .272, good enough for 5th in the league for outfielders. Toronto isn’t quite the launching pad with home runs as usual, sitting at 9th in HRs this year after producing the third highest total last season. The third left-hander of my Rockies stack to tee off on Lohse. Braun continues to be a well-rounded fantasy contributor with 13 home runs and 6 stolen bases. For good measure he gets to bat at Coors Field.